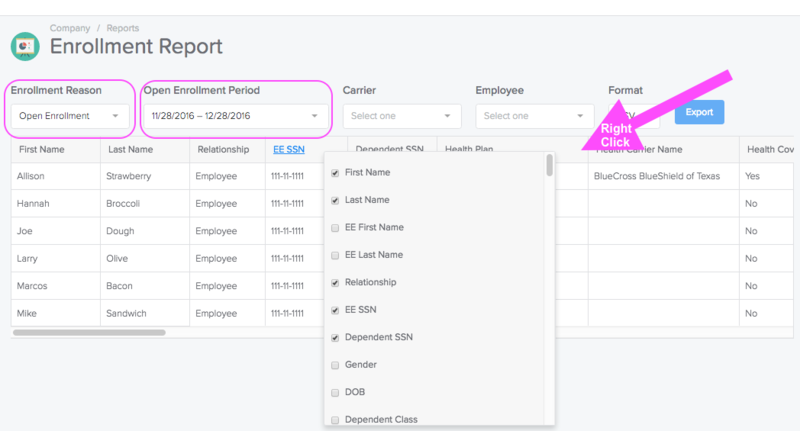 As an admin, how do I see what plans my active and terminated employees are enrolled in? From the Company page, click the reports tab on the left in the navigation menu. Find the Enrollment Report card and click the download arrow. 3. Now you'll see the report! Make sure you choose the correct Enrollment Reason and Open Enrollment Period. Also, to add additional fields, just right-click on any column heading then check the additional fields you'd like to add to the report.